Fort Buchanan is the only active US Army facility in Puerto Rico. 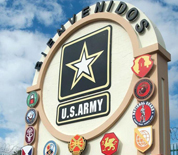 Located in the capital, San Juan, Buchanan is home to approximately 130,000 members of the military community and is host to several tenant units including the 1st Mission Support Command of the Army Reserve and reserve components of the US Navy and the US Marine Corps. The main mission of the base is to provide operational support for all Army Reserve units in Puerto Rico and the US Virgin Islands but maintaining services and facilities and enhancing the overall well-being of the community. This Fort Buchanan directory features the critical info you’ll need to navigate through the many facilities and recreational opportunities available on base­­.